Prenups aren’t for everyone. Some people will refuse to get one for ideological or religious reasons, but others simply don’t have a financial or life situation that warrants one. If you’re both coming to the table with no major assets; don’t own a business; don’t plan to have kids, and are unlikely to inherit wealth, you probably don’t need a prenup. And if one or both of your lives changes significantly down the road, you can always do a postnup. If one or more of those apply to you—or you just think it’s smart to get a prenup—then here’s how you can go about preparing one. Each state is governed by different laws when it comes to how assets and debts acquired before and during marriage are handled. It’s incredibly important that you understand the laws that govern your marriage before saying, “I do” because that could dictate whether or not you want or need a prenup. Nine states are known as community property states: Arizona, California, Idaho, Louisiana, Nevada, New Mexico, Texas, Washington, and Wisconsin. Alaska offers an opt-in option for being a community property marriage. A community property state adheres to a 50-50 split of marital assets and, even more concerning, debt. Debt that was created in the marriage, regardless if only one party’s name is on the debt, could be considered community property and therefore both parties are on the hook. Again, it’s important you look up exactly how your state specifically handles the situation. Spoiler: this could help reduce the cost! You and your partner should attempt to get on the same page about what you want in a prenup before either of you sit down with a lawyer. The two of you should decide what you feel is fair and what you want to both be protected in the case of a divorce. Having a really frank conversation and writing down your thoughts before going to the lawyers should help minimize the billable hours. Obviously, you need to have asked your partner about signing a prenup before you even launch into this detailed conversation. That’s right, lawyers, plural. You each need individual representation looking out for your best interests when creating a prenup. If one of you elects to not have representation, then the prenup will likely have a bunch of language about how you’re waiving your right to counsel and you understand you should have counsel but you decided not to even though your partner and his/her lawyer told you to get counsel. You get the picture. But both of you having a lawyer will also help uphold the prenup in the case of a divorce. 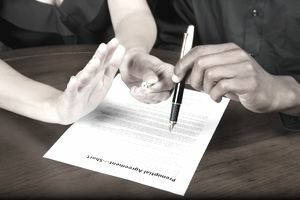 One party signing without representation could be a way for your partner’s divorce lawyer to argue your partner signed it under duress or didn’t really understand what he/she was signing. As far as how to actually go about finding the lawyers, the best way is recommendations from your own network of friends and family who have used a lawyer for a prenup. However, you may feel uncomfortable even telling people you’re drafting a prenup, so other options could be any lawyers you personally know—especially ones who have worked with you in the past. Or your financial advisor may have a good recommendation. You can also use sites like Avvo or Nolo to search for lawyers in your area. Be sure to get a lawyer that’s in your state and is therefore familiar with your state’s laws. You should shop around for your lawyer. Most of them will do a 15-minute phone call with you to hear about your case, which also gives you a chance to see if you feel compatible with the lawyer. This should be someone you trust and makes you feel comfortable. You shouldn’t have to pay a full hour’s fee for a consultation to see if the lawyer is someone with whom your compatible. Ask about your lawyer’s rates and his or her estimation on how long it will take to draft your prenup. It helps to have a ballpark on cost. A retainer, to start! Depending on the law firm you hire, you’ll probably be required to put down a retainer after signing a letter of representation. The retainer should be applied to the total cost of the prenup. Generally, you can expect to spend $2,000 to $3,000 per person for a straight forward prenup. It sounds like a lot, but it’s like an insurance policy on your marriage. Should you ever need to use it, then it will have probably been an investment well made. Next, your lawyer will need to hear about any particular clauses that would be outside the ordinary. For example, maybe you plan to pay off your partner’s debt within the first year of marriage but would like to be repaid if the marriage were to end in a certain period of time. You’ll also need to provide a document listing the balance and account numbers (last four digits should suffice) of all your assets and debts. All of them. Any property you own as well as checking, savings, investments, retirement accounts, student loans, any credit card debt—it all needs to go to your lawyer. Failing to disclose any accounts could be grounds to void your prenup as it could be spun that you were trying to hide assets or debts. You don’t need two prenups from two lawyers. Designate one of your lawyers to initiate. Then you can read the draft and discuss it with each other and send your feedback for any changes to the lawyer drafting the document. By the time the second lawyer sees the prenup, it can already be in a good and fair place to reduce a bunch of back-and-forth. There are certainly options to do a DIY prenup with online services. It’s significantly cheaper, but it also may not hold up when you’d need it to, especially if you have any complicated clauses. No matter how strong and healthy your relationship, there will be tense moments when going through the prenup process. You might get angry with one another or feel your partner is being unfair, especially if your lawyer is implying you’re being screwed. Take the time to sit with your feelings separately and have a cooling off period before coming back together and discussing what triggered your feelings and how the issue can be resolved. What Is Community Property, and How Does It Impact Your Living Space?